Sandra Vanderpool’s paper dolls are truly works of art because her technique blends perfectly her painterly technique, a keen eye for detail and a marvelous imagination. Her studio in Colorado houses an extensive reference library that explains her exquisitely executed paper dolls based on vintage film, historical subjects or fantasy. Like most contemporary paper doll artists, as a child Sandy collected paper dolls, encouraged by her doting grandmother. After receiving a BFA at the Art Center College of Design in Los Angeles, she freelanced as a fashion illustrator for various clothing manufacturers and for Women’s Wear Daily. She then changed career paths and managed a fashion store where her customers were often movie stars. Again, a career switch, this time back in her home town of Denver where she began teaching art. One of her students, there on the GI Bill, became teacher’s pet and they married. Now Sandy and her husband John live happily, two artists sharing their life’s work. He specializes in Western, Native American and Victorian subjects while Sandy is focused on fashion, Hollywood and history. Sandy says, “John understands my work schedule and doesn’t get upset if the dishes don’t get done that night or housework goes begging when I need to meet my deadlines.” Multi-talented Sandy also creates meticulously furnished, miniature doll houses. Often her two interests mesh when she creates paper dolls with beautifully detailed settings for displaying them. Sandra Vanderpool’s work is infinitely collectible, bringing together exceptional artistry and a soaring imagination. 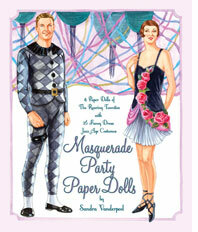 Paper Studio Press titles by Sandra Vanderpool include: Masquerade Party, Fairyland and Hollywood Goes to Egypt and Signs of the Zodiac.